The Plug-Tug makes removing fiddly plugs less of a hassle. They are easy to attach and use. Do you find pulling a plug out difficult? 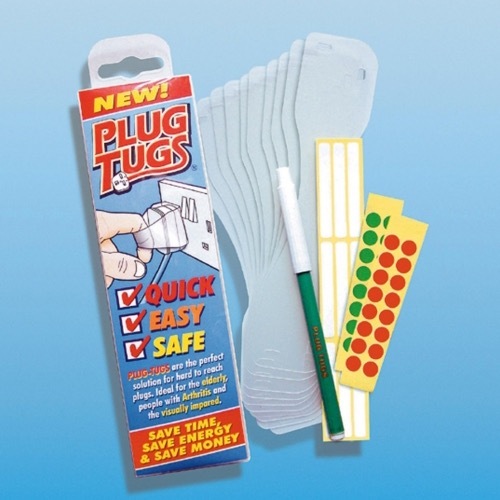 The Plug-Tug plug puller makes removing fiddly plugs less of a hassle. They are easy to attach and use. They help you identify confusing wires and plugs as it includes a range of stickers, labels and a marker pen. Single pack contains 10 Plug Tugs. The plug tug is fitted around the plug itself, leaving a loop at the back that provides extra leverage when pulling the plug from the socket, - a really simple and effective solution. These loops should not be used in any location accesible to small children.